Q1. What kind of vision is the azbil Group aiming to realize? We aim to become a global company that deploys cutting-edge technology driven by “human-centered automation” to help realize a future society and industry with a balance between economic development and solving social issues. The azbil Group has pursued automation technologies for more than a century. Automation is the core technology that supports the basic cycle of achieving targets, accomplished by setting targets and analyzing situations to identify issues, then appropriately addressing those issues. This technological domain will continue to evolve as we incorporate new targets and technologies into the cycle. We have achieved ongoing growth by advancing our business with automation at its core. This goes beyond simply controlling machines. Rather, it is as a characteristic unique to the azbil Group passed down by its founder, who emphasized the notion of “using the power of technology to free people from drudgery.” Accordingly, we have refined various technologies and services based on the idea of always focusing on people to solve problems. This quest for automation derives from a corporate culture built on DNA inherited since our foundation. The quest has then brought us to establish our philosophy “human-centered automation,” which aims to bring improvements in comfort and productivity and ultimately give people a sense of satisfaction, as well as its symbol and our current name, “azbil” (automation zone builder). Currently, we are practicing management with this philosophy at the core. We recognize that the azbil Group's corporate values take shape through a process of co-creation together with our various stakeholders— including shareholders, customers, suppliers, employees, business partners, and society. We adopt a broad interpretation of corporate social responsibility (CSR), positioning “basic CSR” as what we must fulfill in order to exist in society and “proactive CSR” as helping resolve social issues through our core business and the like. We see our corporate value through implementation of both basic CSR and proactive CSR, and practice “CSR-focused management” driven by both perspectives in a balanced manner unique to the azbil Group. On the business front, based on this “human-centered” perspective, we have leveraged our proprietary automation technologies to advance our operations in three market segments, each with different characteristics, in order to spread our business environment risks. These segments—Building Automation (BA), Advanced Automation (AA), and Life Automation (LA)—are now steadily expanding their respective business domains, taking advantage of the sophistication of social issues and technological progress in such areas as IoT, big data, and AI. At the same time, in addition to developing and making high-quality products as a manufacturer, we are enjoying increasing opportunities to offer varying services. With advances in information and communication technology (ICT), it is now possible to narrow down big data via the Internet, and to use AI to make complex decision-making tasks and provide associated services. Indeed, the so-called “fourth industrial revolution” aimed at resolving multiple social issues is making good progress. In its 5th Science and Technology Basic Plan (fiscal 2016–2020), meanwhile, the Japanese government proposed “Society 5.0*1”as a human-centered society that balances economic development and solving social issues. This can be overlaid with our future vision. In other words, the azbil Group, envisioning a world-leading “super- smart society,” will combine its cutting-edge automation technologies and services with the “human-centered” concept. Our aim here is to become one of the world's leading corporate groups that helps build a society in which humans and technologies collaborate at a more advanced level. *1. Society 5.0: One of the basic guidelines of the science and technology policy proposed by the Japanese government in the 5th Science and Technology Basic Plan (fiscal 2016–2020). Its predecessors are Society 1.0 (Hunting society), Society 2.0 (Farming society), Society 3.0 (Industrial society), and Society 4.0 (Information society). Society 5.0 is a “super smart society” in which, driven by the fourth industrial revolution, a succession of new values and services are created to enrich people's lives. Through its pursuit of “human-centered automation,” the azbil Group will help realize a society and industry envisaged by Society 5.0 by creating and providing new levels of value in automation. Q2. Please describe the direction of initiatives under the Group's medium-term plan aimed at achieving long-term targets for fiscal 2021. We are driving aggressive management with a focus on expanding business areas earmarked for sustainable growth. The current medium-term plan (fiscal 2017–2019) is the second step towards achieving our long-term consolidated targets for fiscal 2021, specifically, net sales in the ¥300.0 billion range, operating income of ¥30.0 billion or higher, and ROE of 10% or higher. It is positioned as a three-year period for establishing a business foundation enabling us to secure business growth and high-level profits after the Tokyo Olympic and Paralympic Games in 2020, while aggressively promoting reforms of governance, compliance, and human resource development related to corporate sustainability. Specifically, we are focusing on more aggressive management to implement the three fundamental policies of the plan: (1) Being a long-term partner for the customer and the community by offering solutions based on our technologies and products; (2) Taking global operations to the next level by expansion into new regions and a qualitative change of focus; and (3) Being a corporate organization that never stops learning, so that it can continuously grow stronger. Guided by these policies, we are promoting new product development and strategies through three fields: “Strengthen life-cycle solutions business” (supply value matched to each development stage of the life cycle of a customer's business), “Develop new automation fields” (respond to innovation born from combining “things” and information), and “Expand environmental and energy fields” (provide solutions to the long-term issues of environmental impact reduction and energy demand restraint). In fiscal 2019, the final year of the plan, we are targeting consolidated net sales of ¥270.0 billion, operating income of ¥25.0 billion, and ROE of 9% or higher. Q3. Please describe the Group's performance in fiscal 2017, the first year of the medium-term plan. We achieved a significant increase in earnings thanks to successful efforts to improve profitability, with the help of a healthy business environment. Against the backdrop of vibrant investment in domestic urban redevelopment, demand for equipment and systems for large buildings remained at high levels, while capital spending on production facilities was solid both in Japan and overseas. 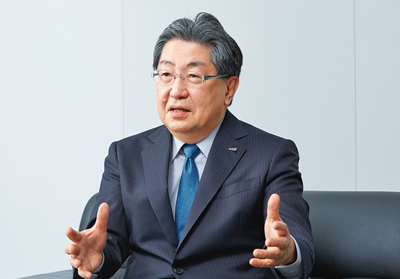 In this business environment, we made aggressive efforts to increase orders, generating a 4.4% year-on-year increase in orders received*2, to ¥266.3 billion. By segment, the Building Automation (BA) business posted a decline in overall orders received due to recoil from the previous year, during which we attracted large-scale multiple-year contracts. However, the Advanced Automation (AA) business and Life Automation (LA) business both reported significant year-on-year increases in orders received. Consolidated net sales rose 2.2%, to ¥260.4 billion, buoyed by sales increases for all three segments, especially the BA and AA businesses. On the earnings side, operating income grew 19.3% year on year, reflecting higher sales and our renewed efforts to enhance profitability from the previous fiscal year. Indeed, operating income exceeded our planned target, reaching ¥24.0 billion, a record-high figure. Ordinary income climbed 18.8%, to ¥24.3 billion, mainly due to the increase in operating income. Net income attributable to owners of the parent rose considerably, up 36.0% year on year, to ¥17.9 billion. In addition to the increase in operating income, this was due to a number of factors, including a gain on sales of investment securities, a decrease in loss on liquidation of subsidiaries and affiliates, and a reduction in tax expenses following a reappraisal of the recoverability of deferred tax assets of a subsidiary. As a result, return on equity (ROE) at fiscal year-end was 10.5%, showing a steady improvement. (Excluding the temporary impact of the gain on sales of investment securities and the reduction in tax expenses of a subsidiary, ROE would have been around 9.5%). *2. Orders received: Effective fiscal 2017, we have changed the calculation of orders received to exclude foreign currency translation adjustments, following a revaluation of our order backlog. Q4. The Group's fiscal 2017 results were better than your forecasts. Do you plan to make any changes to your targets and business strategies? We will step up efforts necessary for sustainable growth while keeping the numerical targets of the medium-term plan unchanged. We attribute our performance in fiscal 2017 to the outcomes of business and operational structure reforms and the backup of a robust business environment. In addition to redevelopment and infrastructure projects currently under way ahead of the Tokyo Olympics and Paralympics, we benefited from rising investment sentiment toward streamlining operations and saving labor—reflecting labor shortages—as well as ongoing healthy business conditions. If such business conditions continue, it will become increasingly possible for us to deliver business growth in excess of that projected under our current medium-term plan. However, we foresee various elements of uncertainty as we look ahead to fiscal 2019, the final year of the current medium-term plan, and also to our long-term targets for fiscal 2021. These include expected contraction of the domestic market stemming from the aging, declining population, as well as issues like trade frictions between the United States and China on the global economic front. Capital investment sentiment is also uncertain, especially in light of limited domestic demand and lack of optimism about its longevity. Therefore, although we recognize the considerable progress of our reform initiatives, we will keep our fiscal 2019 targets unchanged as we further strengthen profitability and expedite efforts to expand our business domains, to enable swift, accurate responses even under changing business conditions. At the same time, we will actively make investments necessary to reinforce our business foundation, from the perspectives of meeting our fiscal 2021 targets and achieving sustained growth thereafter. Q5. Please describe the progress of measures taken in each business segment. We are ahead of schedule with our various initiatives, while the profit structure of the LA business is also stabilizing. In this segment, we are establishing and strengthening systems enabling efficient job processing, while responding steadily to demand for a number of new construction projects that are expected to continue in the lead-up to the Tokyo Olympic and Paralympic Games. These projects will lead to business opportunities through life cycles of buildings, such as services and renovation of existing structures. Regarding new building construction projects, demand is leveling off due to avoidance of the redevelopment rush before the Olympic Games and labor shortages, so we do not foresee a major fall in demand after the Games, which was a temporary concern. In addition, we expect demand for renovation of existing buildings to expand after 2020. Accordingly, we are actively making proposals to capture renovation demand for existing buildings earmarked for growth, while steadily addressing demand for new building construction projects. The increase in these existing building renovation projects, which are highly profitable, will help us improve this segment's profitability in the future. In fiscal 2017, meanwhile, we introduced building automation systems to address customers' needs throughout the life cycles of their buildings and facilities, by embracing IoT and other technological trends and strengthening open networks. On the global front, we steadily built on our track record of achievements in landmark projects in Asia. In this segment, we are focusing on efforts to improve profitability and expand businesses in overseas and other growth markets. Specifically, we are entrenching operations in our three business sub-segments*3 and meticulously addressing needs from upstream to downstream via our integrated system, covering everything from marketing to development, production, sales, and services. In the domestic petroleum and chemical sectors, we are deploying IoT, big data, and other technologies to advance into new domains, such as smart industrial safety system, while working to improve profitability in areas where demand is stable, notably main- tenance and equipment replacement. In addition, we are introducing products that support automation in a variety of production processes. These include high-precision laser sensors for cutting-edge growth markets in Japan and overseas, notably semiconductor devices, flat panel displays (FPDs), and rechargeable batteries. As a result, in fiscal 2017, we achieved an improvement in profit that exceeded the forecasts of our plan. Going forward, we will continue striving to enhance profitability. At the same time, we will expedite efforts to expand our business in high value-added domains by concentrating human and other managerial resources in areas where the azbil Group can demonstrate its strengths. These include semiconductor manufacturing equipment, high-performance materials production equipment, and combustion-related equipment. Control Product (CP) business: Supplying factory automation products such as controllers and sensors, etc. Industrial Automation Product (IAP) business: Supplying process automation products such as differential pressure & pressure transmitters, and control valves, etc. Solution and Service (SS) business: Offering control systems, engineering service, maintenance service, energy-saving solution service, etc. In the LA business, as well, we are seeing the benefits of our business restructuring and business infrastructure development as we establish a stable earnings structure. In addition, we are opening and entrenching our presence in new fields, taking into account advances in the deregulation of the domestic gas market, as well as IoT and other technological innovations. For example, we developed a new intelligent LP gas meter with a built-in communication module compatible with LPWA*4 networks, and we are participating in verification projects for remote measurement of meter reading values. In the Life Science Engineering (LSE) field, we have developed an automatic loading and unloading system for freeze-drying equipment that contributes to improved safety and productivity of pharmaceutical manufacturing. Going forward, we will continue striving to stabilize and improve the profitability of each of this segment's business fields. At the same time, we will demonstrate Group synergies that transcend segment lines to create business opportunities in the market for gas and other energy supply, while developing new products and services in response to changes in the global pharmaceuticals market. *4. LPWA (low power wide area): A wireless communication technology that enables long-distance communication using much less power than previously; it is expected to be utilized in IoT development. Q6. Overseas capital investment is strong, but what is the status of global expansion, which you have identified as a growth field? We aim to improve our brand's strength overseas by advancing a business model unique to the azbil Group, with solutions as the main component. In the face of progressive economic globalization, the azbil Group has earmarked overseas markets as a growth field as it works to further solidify its business foundation as one of its basic policies. Currently, we are strengthening our sales and service network and broadening our procurement and production system to target overseas business growth. In the process, we have identified some regions and businesses that require partial strategic reassessment, but this experience has enabled us to accumulate various knowledge and deploy new response measures. We are now entering the stage in which we can book profits from the upfront investment phase, allowing us to witness a certain level of progress. Under our current global expansion, we have identified several key challenges for achieving the next stage of growth: accumulate a proven track record, leverage that track record to build relationships of trust with customers, and improve our brand power. In the BA business, therefore, we focused on acquiring projects at core buildings, commercial facilities, airports, and the like in each nation. During the year, we introduced state-of-the-art building automation systems, featuring advanced environmental controls that integrate leading-edge technologies, into Thailand, Singapore, and other overseas markets ahead of the domestic market. As a result of these efforts, we have created a business model originating in Japan that provides comfort and energy savings at each stage of the building's lifecycle. This model is gradually being acknowledged in Asian countries, helping us add to our record of achievement. In the AA business, as well, several offerings unique to the azbil Group have received high praise overseas on a par with Japan. These include “smart industrial safety system” services and systems, such as remote maintenance for valves and anomaly monitoring systems incorporating advanced sensing, analysis, and AI technologies, as well as laser sensors that measure position, thickness, width, and other aspects of materials, including high-performance film, during the various processing and assembly processes of manufacturing. We are also receiving more and more inquiries about solutions offered by the azbil Group in specialized fields in markets related to chemical and other process automation, as well as markets related to factory automation equipment, such as semiconductor manufacturing equipment and rechargeable battery manufacturing equipment. Our greatest assets are the deep relationships of trust we have cultivated as we have addressed strict demands from customers seeking to create and produce environments with world-leading levels of comfort on a global scale, as well as our in-depth business development covering entire life cycles, derived from our provision of advanced technologies and services. Products and applications born from these assets, as well as solutions that augment our services, represent the source of the azbil Group's unique identity and competitiveness. With respect to expediting our global expansion, we opened the Strategic Planning & Development Office for Southeast Asia in Singapore. This new office is responsible for cross-divisional planning, strategic, and management functions. Looking ahead, we will further strengthen our systems in each country. This will include developing human resources to provide solutions across the life cycles of our customers' equipment, even in overseas markets. We will also actively build partnerships, including through M&As, with domestic and foreign companies with strengths in products, sales and service networks, and other areas. In overseas markets, we will leverage the azbil Group's strengths to develop business models and domains and thus further expand our operations. Q7. How do you plan to reinforce azbil's Group-wide operational foundation to achieve sustainable growth? In addition to continuously strengthening Group governance, we are forging ahead with new initiatives in production and R&D. Also, we are creating environments enabling individuals to more smoothly demonstrate their capabilities. First of all, we are restructuring our production system. 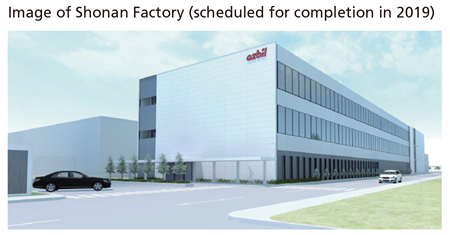 In Japan, we will consolidate the production functions of our Shonan Factory and Isehara Factory into the Shonan Factory, which will be positioned as the azbil Group's “mother factory” that will spearhead improvements in the competitiveness of the Group's overall manufacturing in Japan and overseas, by addressing customers' needs for customized and other high value-added production solutions. Our plan is for the Shonan Factory to evolve into a next-generation facility with advanced technological power and production lines. At the same time, we will invest in facilities and equipment at the Fujisawa Technology Center and embrace cutting-edge key technologies in our quest to further strengthen the azbil Group's unique production technologies. Overseas, meanwhile, we have constructed a new building at the Thailand Factory, through which we will expand the supply of products to Southeast Asia and neighboring Asian countries. Second, we will deploy IoT and AI technologies to strengthen our responses to demand for innovation across all industries. With the establishment of the IT Solutions Headquarters, we now have a framework in place for accelerating the development of products and services featuring these advanced technologies. Focusing on human-machine collaboration, meanwhile, we are combining robotics and proprietary advanced devices to develop next-generation smart robots that offer attractive new ways of manufacturing. Third, we will strengthen Group governance. Specifically, we will establish personnel and mechanisms conducive to business and operational expansion, and we will gradually introduce a core information system to domestic and overseas Group companies so we can roll out these standard mechanisms globally. This will enable us to unify the management of our business activities, which is an urgent issue as we expedite our global expansion. Finally, we will strengthen our human resources so that we can respond flexibly to the transformation of labor quality stemming from technological innovation and market changes. Specifically, we will review business processes in response to market conditions and trends in IoT and other technologies. At the same time, we will reform our personnel system to facilitate the development of human resources who promote continuous value creation, and also to support and evaluate their ability to demonstrate their capabilities, based on a consistent concept covering all employees. This will enable us to undertake swift reforms of workstyles and other business structures. Q8. Please describe your capital policies. In fiscal 2018, we declared a significant year-on-year increase in dividends, as we did in fiscal 2017. We also implemented a repurchase of own shares. 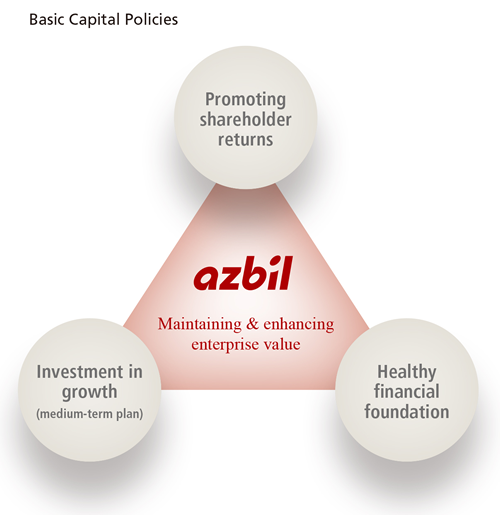 Seeking to increase shareholder value, the azbil Group promotes a disciplined capital policy. Our aim is to achieve return on equity (ROE) of 10% or higher as a long-term target, while taking into consideration a good balance among the three fundamental objectives of enhancing shareholder return, investing for growth, and maintaining a sound financial foundation. We regard shareholder return as an important management priority. Here, we comprehensively evaluate our consolidated business performance, ROE, and dividends on equity (DOE), as well as the need to retain internal reserves to develop our future business and reinforce our corporate structure. Our shareholder return policy, which centers on dividends, also includes flexible share buybacks. We pay particular attention to maintaining stable dividends while raising their levels. Based on the above policy, we repurchased 710,000 shares (valued at around ¥3.0 billion) in fiscal 2017 as part of our shareholder return commitment. Buoyed by a solid business performance, we also declared annual cash dividends of ¥82.00 per share (including the interim dividend), as announced in May 2017. In light of the operating environment, as well as our business structural reforms and efforts to reinforce profitability, we will further strengthen returns to all shareholders in fiscal 2018. Specifically, we plan to pay annual cash dividends of ¥92.00 per share, up ¥10.00 year on year, reflecting our forecast for increased earnings from our ongoing business activities, as well as our medium-term plan and prospects for sustainable growth. In addition, at the same time of improving capital efficiency, we are committed to further enhancing shareholder return and implementing flexible capital policies according to changes in the corporate environment in a manner that reflects our performance situation and outlook. With this in mind, we implemented another repurchase of own shares*5, with an upper limit of 1 million shares or ¥5.0 billion in acquisition value, since the close of fiscal 2017. We are also committed to investments aimed at realizing sustainable growth and strengthening our management structure. Accordingly, we will continue striving to further increase shareholder value by retaining earnings and otherwise effectively deploying our capital. Specifically, we will focus on strengthening and expanding our business foundation, including by enhancing our lineup of growth-oriented products and services, while restructuring our advanced global production and development systems. We will also promote M&As and other future growth investments. In addition, we will continue maintaining a sound financial foundation that will enable us to run our business and fulfill our responsibility to supply products even in unforeseen circumstances, such as the occurrence of large-scale natural disasters. *5. Completion of repurchase of the Company's own shares: The Company repurchased 936,200 shares, for a total acquisition value of ¥4,999 million, between May 14 and June 19, 2018. Q9. What kind of initiatives are you taking to strengthen corporate governance? We will increase the number of independent outside directors to strengthen the oversight function and expand diversity. We will also pursue higher management transparency by abolishing the counselor and advisor system. For some time, the azbil Group has been working to strengthen corporate governance as a priority issue while creating a stable, highly profitable structure that earns high praise from shareholders and other investors. Following deliberations held by the Nomination and Remuneration Committee, of which outside directors form the majority, in fiscal 2017 we reorganized the remuneration system for inside directors, replacing it with a performance-oriented system linked with the Group's long-term targets and medium-term plan achievements. In fiscal 2018, we increased the number of our independent outside directors from the current three to four, so that our outside directors account for more than a third of our Board of Directors. As a result, we strengthened the management oversight and diversity, not only with respect to professionalism, experience, and knowledge, but also nationality and gender. We look forward to receiving various valuable opinions from outside directors as we target sustainable company growth and increased corporate value in the future. In addition, the Board of Directors resolved to amend the Company's Articles of Incorporation to abolish the system of counselors and advisors, established to advise the president, having deemed that such a system is no longer necessary. Going forward, we will continue enhancing management transparency and further strengthening corporate governance. In light of a recent revision of Japan's Corporate Governance Code, we have sought continuously to ensure objectivity and transparency through a policy of reducing company strategic shareholdings and that of appointing and dismissing executives. We are also striving to enhance timely, appropriate dialog with all stakeholders, including shareholders and other investors, in an initiative spearheaded by our executive officer in charge of corporate communications. Through these activities, we will continue strengthening corporate governance to deliver sustainable growth and increased corporate value over the medium and long terms. Q10. How are you addressing moves in the capital markets to evaluate companies' ESG initiatives? We are implementing “CSR-focused management” unique to the azbil Group. As a result, our shares have been included in several ESG*6-related indices. As mentioned earlier, the azbil Group practices various policies based on its unique “CSR-focused management” approach, which transcends the notion that “CSR equals social responsibility.” In fiscal 2017, the Company was included in the FTSE4Good Index Series, a leading socially responsible investment (SRI) index, for the 11th consecutive year. We were also included as a constituent stock in ESG indices*7 newly selected by Japan's Government Pension Investment Fund (GPIF), one of the world's largest pension management organizations. The inclusion of our stock in multiple ESG-related indices illustrates the high evaluation of our ongoing ESG-related initiatives under our unique CSR-focused management approach. Recently, the spotlight has been on the Sustainable Development Goals (SDGs) adopted by the United Nations. Since our establishment, we have emphasized our “human-centered” perspective and actively sought to resolve global environmental and other social issues. We believe there is a high correlation between these activities and the SDGs. Rather than engage in small-scale initiatives to address ESG-focused trends in the capital markets, we believe that benefiting society through our core business—based on our Group philosophy of “human-centered automation”—will lead to both better ESG outcomes and achievement of the SDGs. With this in mind, we will fully demonstrate our approach to practicing CSR-focused management in a sincere manner, and thus earn recognition of the azbil Group's growth potential and sustainability. As a result, we will continue striving to remain included in various ESG-related indices. *6. 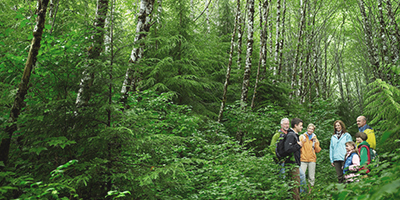 ESG: A collective term covering three elements—environment (E), social (S), and governance (G)—that is used to determine a company's ability to grow in a sustainable manner. It is often used for reference as an investment indicator. *7. ESG indices: FTSE Blossom Japan Index, etc. Q11. What is your performance outlook for fiscal 2018? We will target further record-high earnings by stepping up business strategy implementation and profitability improvement. In fiscal 2017, the first year of our medium-term plan, we achieved better results than planned, thanks to the significant progress of our business measures and profitability improvement efforts, buoyed by a robust business environment. In fiscal 2018, as well, we expect domestic and overseas business conditions to remain favorable. Based on this assumption, we will step up business measures and efforts to improve profitability that produced good outcomes in fiscal 2017. At the same time, we will make forward-looking investments— including in R&D and enhancement of our production system— aimed at establishing a business foundation to permit sustained future growth. As a result of such investments, we forecast an 8.2% year-on-year increase in operating income, to ¥26.0 billion—another record-high figure following fiscal 2017—as well as a 2.5% rise in net sales, to ¥267.0 billion.